There are so many exciting things to do and visit in Ilocos Sur. You can start with Vigan followed by the Crisologo Museum, Vigan Park how about a little bit of strolling in the City to enjoy the famous empanada, okoy and other delectable Ilocos goodies. Found in the province is the historic town of Vigan, which was inscribed in UNESCO’s World Heritage List in November 1999. 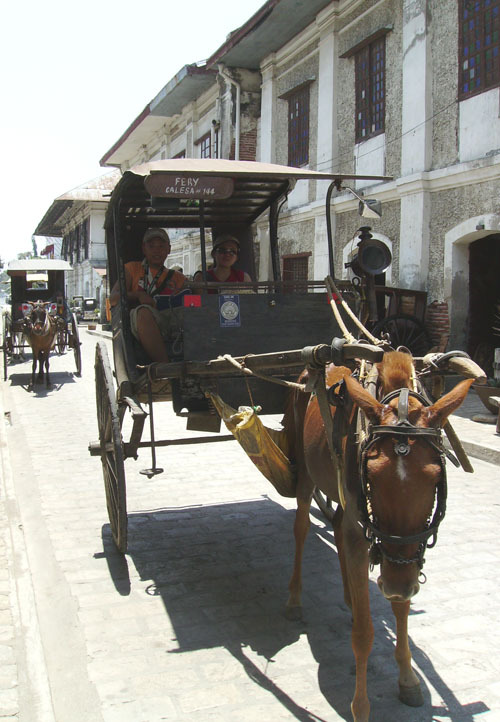 Established in the 16th century, Vigan is the best preserved example of a planned Spanish colonial town in Asia. Its architecture reflects the coming together of cultural elements from elsewhere in the Philippines and from China with those from Europe to create a unique culture and townscape without parallel anywhere in East and Southeast Asia. Its Kamestizoan District is replete with ancestral houses with ancient tiled roofs, massive hardwood floorings, ballustrades and azoteas in varying Spanish-Mexican-Chinese architectural styles. Centuries-old Sta. Maria Church, declared a National Landmark, was used as a fortress during the Philippine Revolution of 1896. Tirad Pass, declared a National Shrine, had been the last stand of the Filipino Revolutionary Forces under General Emilio Aguinaldo during the same period. Bessang Pass served as the backdoor to General Yamashita’s last ditch defense during the last stage of World War II. Burnay, are the big jars where the delicious bagoong(shrimp paste) are usually kept in Ilocos. You can drop by and watch them make them and help preserve this legacy. A family museum of the famous Crisologo family of Ilocos. Marvel at their car collections and other historical related artifacts. One of Vigan’s newer attractions is the Baluarte Zoo which is owned by then Ilocos Sur Governor, Chavit Singson. The zoo houses a wide array of animals like pythons, tigers, snakes, birds, ponies and a whole lot more. Kids and kids at heart will surely love this place!